Vilnius Mayor Remigijus Šimašius together with the Dutch Ambassador Bert Van der Lingen unveiled on Thursday 'Holland straat', the Dutch version of 'Olandu Gatve', at Vilnius College of Technologies and Design, represented by Director Nijolė Kikutienė. During the short ceremony, the mayor congratulated the Dutch Ambassador on the national holiday, King's Day. The Netherlands now has a king, but the country was ruled for more than 100 years by a Queen. 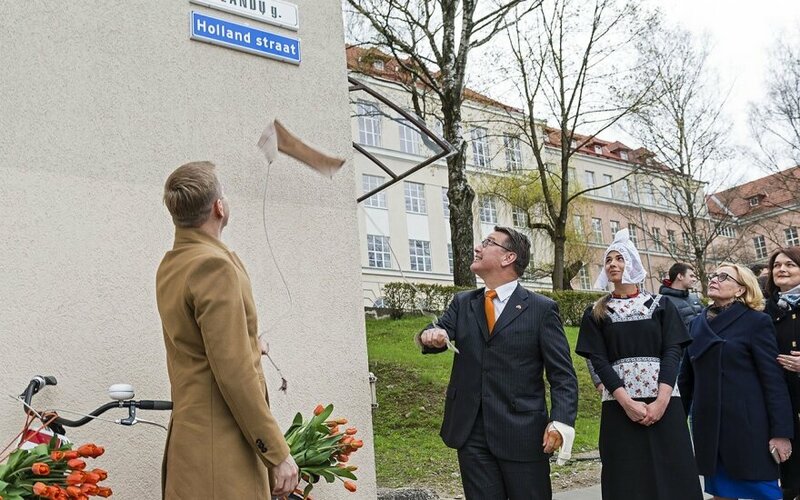 The mayor said, "I am glad to have a on this Royal occasion the opportunity to 'rename' to 10th street in another language in Vilnius'', and he added 'It is symbol of the city that wants to be open and welcoming to all living here and visiting.'' The mayor expressed his thanks for a number of Dutch initiatives, including the free little library in Bernadino Park, a car shaped bicycle rack, Dutch tulips and the cooperation with designers and urban and mobility planners. Ambassador Bert van der Lingen expressed his pride that the Netherlands was selected for yet another beautiful design and was visibly pleased seeing the street name in Dutch, particularly a street sign that it is located at the Vilnius College of Technologies and Design. The institute has also close cooperation with the Netherlands. The Graphic Design Department faculty and students of the Institute produced also some infographics for the Dutch embassy. The Mayor and the Ambassador toured some of the facilities in the Institute after the inauguration of the street sign.